I love the photos, Shining Time! Your layout is very impressive! Well, I’m back again with another update. No real update on Toby and Henrietta but I may get around to working on Toby again soon. Work just picked upit will probably be a while until then. On a 009 note I was able to preorder two of both the narrow gauge coaches at TrainWorld. They are up for preorder on there for $30, which is a better price than $42. Hopefully they will be worth the wait. 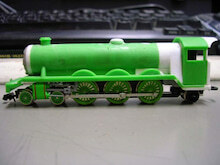 I also managed to get the Bachmann Baldwin for my birthday earlier this week. It’s a really stunning model for Bachmann’s first RTR 009 locomotive. It actually looks great alongside Skarloey and Rheneas (and of course Duke too!). Definitely has me excited for the Hunselts that they announced earlier this year. Though I imagine those probably won’t be out for at least a few more years since the Baldwin’s were announced back in 2014 (even earlier than Skarloey’s announcement!). Nice additions; The Baldwin looks especially impressive. I’m glad to see that TrainWorld now has the narrow gauge carriages listed. Still wondering if Bachmann will use just one tooling for both carriages or go the extra mile with two toolings (the red carriage being based off Talyllyn Coach 1-3, and the blue carriage being based off Talyllyn Coach 4). Would be nice to see the blue carriage in the light blue color scheme too. However, if it comes down to one tooling, which would it be? I would think, if they only use one tooling, that they would use the Red Coach tooling, as that is closer to the CGI Series version of the Narrow Gauge Coaches. I want to pre-order the coaches. If they are two different versions I will be happy. If the coaches have one tooling I will be disappointed on one set of cars than two. 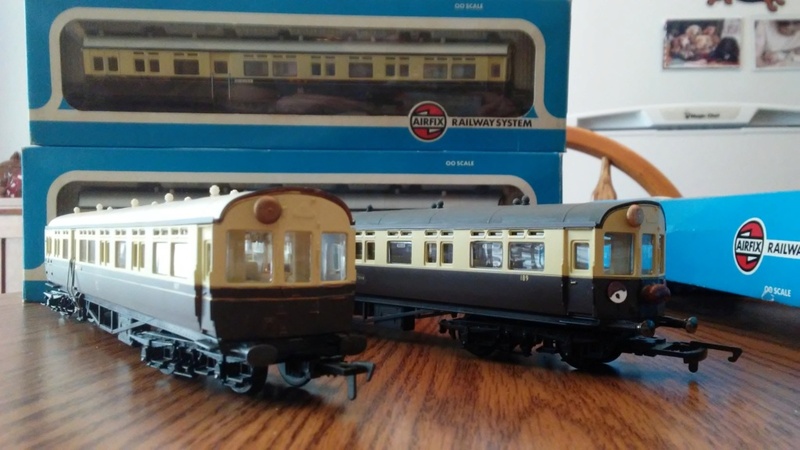 I recently picked up three more autocoaches at good prices, as they were pre-owned. Now I have all of Isabel, Dulcie, Alice, and Mirabel. I need to paint their roofs the same charcoal color as Isabel's and add faces. I will also probably add names (like Annie and Clarabel) because with so little room to work with, because of the windows and non-flat ends, I don't really think that I can make four faces that are especially distinct from each other. With cooler weather coming around the corner, it'll soon be optimal weather to paint in again. Oh man, what a nice collection of freight cars. Are the going to repaint all those S.C. Ruffey freight cars? Technically not all since you need one non touched. After several months buying the red coaches I recently purchased one red brake coach. For the two red coaches I might later on get the other brake coach to make two trains. Yes, I plan to repaint the spare Scruffeys into the green Season 2 open wagons. Progress on Toby is coming along, a friend of mine is helping me with getting the body ready, it will be on Shapeways at some point whenever finished and I can finally get started on Henrietta. 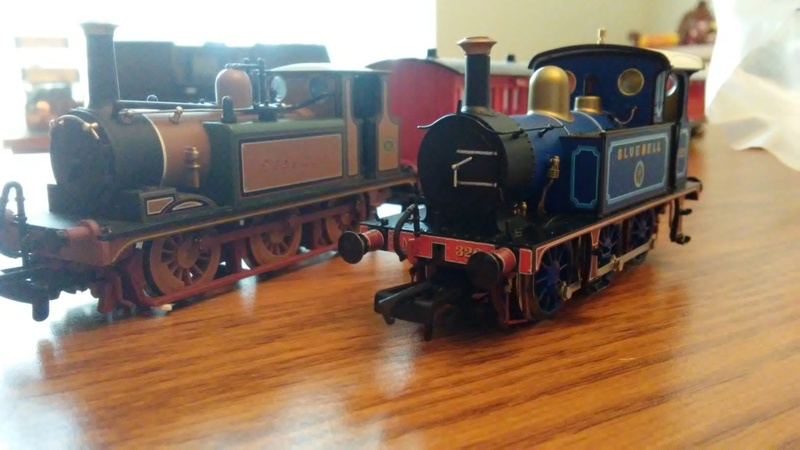 Any others though I’m going to wait til the “Scale Rail” shop finishes Gordon and may look into some of the other engines and stock he is planning on making. I can't say that I have much interest in recollecting the standard gauge characters in a smaller scale, but I do love how the Tomix Clarabel was actually made with her guard compartment rather than reusing Annie's body. 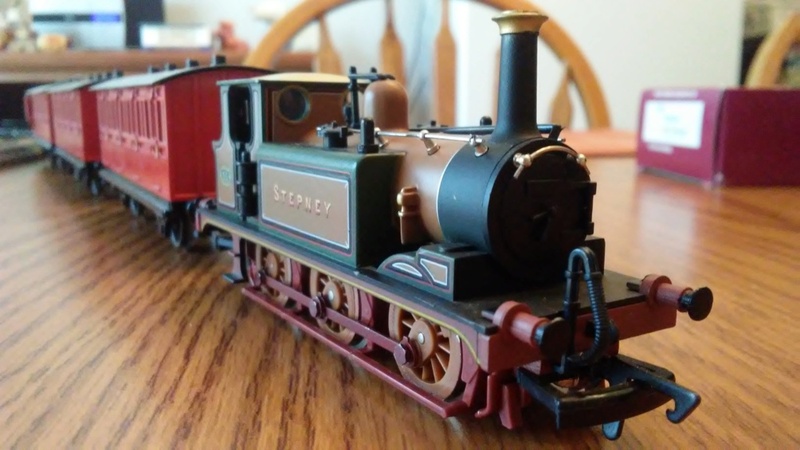 Also, my non-Thomas Stepney model arrived today. I don't have any plans to modify him into a Thomas model, so I'm still hoping that Bachmann releases a Stepney model. 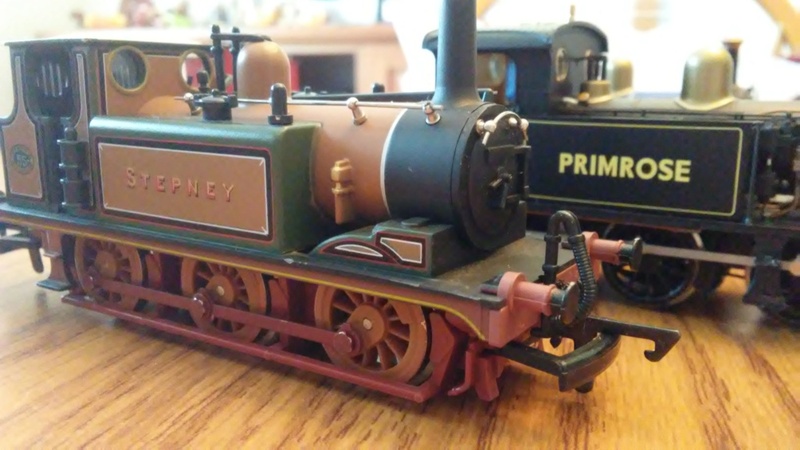 He more fits into my mini-collection of Bluebell Railway, and you can see him below with Bluebell and Primrose. Does anyone have any insight on whether the Bluebell Railway has any say in how Stepney's image is used? I would think that they don't and that whoever holds the rights to Thomas and Friends has the rights to Stepney the character, but I'm not sure. I know that there is children's newsletter from the Bluebell Railway called Stepney's Club (or something like that), which would capitalize on children's familiarty with Stepney through the RWS/T&F, but I don't think it ever portrays Stepney with a face. For my birthday, I got the Narrow Gauge blue box van and the slate wagon with no number. Love that P Class! Bought No. 178 a while ago and they're such top-quality models. Might have to get Bluebell as well. As far as Stepney goes, I'm not entirely sure myself. That's definitely not something I've heard in the discussion. Perhaps it works like licensing does?